You may not have noticed if you haven't looked at my blog in the past few days, but I'm working on updating things around here. I switched over to the new Blogger, and so I've been working on getting my template back to the way I like it (I LOVE my berry background, but it took me about three days to remember how to get it working!) I need to add some buttons, and I read a LOT more blogs than the list shows. I also want to make a link of things I'm working on and things I've completed, so that will take some doing. In the meantime, I've been spinning a lot more than I've been knitting. I finished my mom's socks and immediately cast on for a new pair of socks. I've started keeping a sock-in-progress in my purse, and I don't know why I never did this before. For a year now I've been saying to myself, "I need to start bringing a lunch with me to work rather than drive home" and it's a lot easier to do when I have a sock in my purse. I have an hour for lunch, and it only takes me fifteen minutes to eat, so now I can knit. This is the new sock, made out of Cascade Fixation. I don't have the ball band nearby, so I can't say what color it is, but I like it. 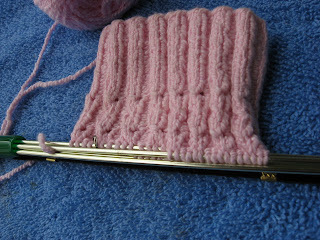 I'm using the Elongated Corded Rib pattern from Sensational Knitted Socks. It's easy to memorize but still rather interesting (at least so far--I've only done about a repeat and a half of the pattern). Somday I want to be like Wendy had have drawers full of handknitted socks. I've plied up all the singles that I had spun up. 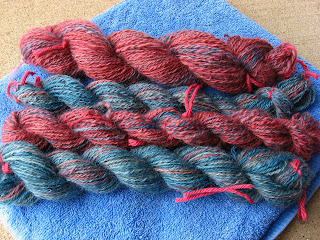 The big red skein is two-ply and so is some of the smaller red skein. When I ran out of one bobbin on the second red skein, I started Navajo plying it. I like that method MUCH better. I like that it produces a rounder, more evenly plied yarn, and it's easier for me to get into a rhythm with the Navajo plying than the two plying. Don't ask me why, that's just the way I spin. So the colors really aren't this bright; I'm still learning how to use the camera settings. I haven't touched the Bristow cardigan for a couple of days. I've had a good week. The weather was GLORIOUS on Monday and Tuesday and Wednesday. I actually broke out my bicycle and rode it to work on Tuesday. It felt so good! I really like my bicycle. 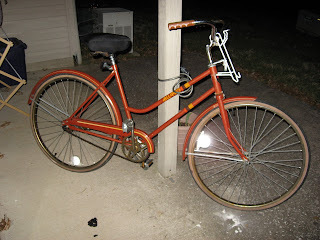 It's an older bike that I found in my Grandpa's garage. He had been storing the mountain bike I'd had since I was a kid while I was serving a mission in the Netherlands and Belgium for the Church I belong to. 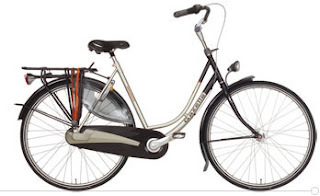 While I was there, I got hooked on the biking and the high quality of Dutch Bikes--like this one. So when I came home and found this bike in my Grandpa's garage, I asked him if I could trade. He tends to have a lot of stuff in his garage that people donate to be sold in yard sale fundraisers for their local boy scout troop. It probably would have been easier to sell the mountain bike, anyway, even if it wasn't new or top of the line. 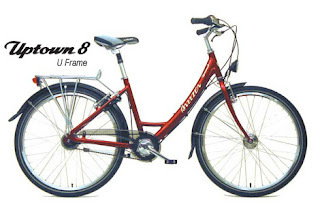 I liked this bike because it had the fenders and the lower frame (not quite a U-frame) that is easier to climb on and off, and the handlebars bent back so that you can sit up straight. It's a one-speed bike, with coaster brakes. I rode it all over campus at college and rode it to work quite a bit the first summer I moved here. But Kentucky isn't quite as flat as Holland is, and I think I'd like something nicer. My single speed is okay for climbing up the hills here in town (although my LUNG CAPACITY could use some development) but it's not really adequate for long stretches of downhill or flat ground. The wheels get going faster than I can pedal to keep up. So, we'll see what happens. On the knitting front, I've made lots of progress. I've turned the heel on my mom's second sock and am about an inch away from starting the toe decreases. The end is in sight! I had a lot of time to work on it this week. I've also picked up my Bristow cardigan for work again over the past couple of weeks. I've done about twelve inches of the second front piece. I'm glad that I made notes of how many rows to do for each step when I made the other front piece--I only hope that my gauge is still the same! Just one last end to weave in, and then a good block and a zipper, and Eris will be done! I went looking for a zipper today. I found one that would match well and almost bought it. 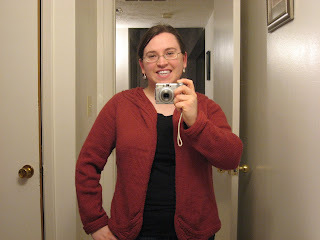 Luckily I realized before I plunked down money that a dress zipper will not work for a cardigan--I need something that will open all the way up. It's slightly easier that way. I may have to try to find one online. None of the stores here have a zipper in the right size and the right color for this project. So it will probably be a while before I can put this in the FO category. But that's not going to stop me from wearing it!